With the continual news coverage about Brexit and its potential impact, Fred. 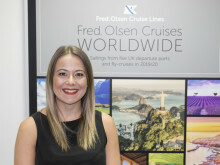 Olsen Cruise Lines is reassuring guests and the travel trade that they can book their cruise holidays with the company with full confidence. “While we live in uncertain times, we are confident that cruising with Fred. Olsen will always be a relaxing and enriching way to discover the world. Fred. Olsen launched its pioneering ‘Enjoyment Promise’ in 2013, from which time it has been offered as standard. Simply book more than 12 weeks ahead on cruises of five nights or more and, if guests find that the cruise is not for them within 48 hours of sailing (24 hours on Brabant river cruises), just let Guest Services know on board the ship and Fred. Olsen promises to arrange and pay for flights back to the UK from the next port and repay the cost of the holiday.